An article in The Denver Post by Michael Booth and Jennifer Brown discussed the possibility of criminal charges against Jensen Farms for its involvement in the cantaloupe listeria outbreak. The article discusses the history of legal charges made in food poisoning cases, including issues of willful negligence. 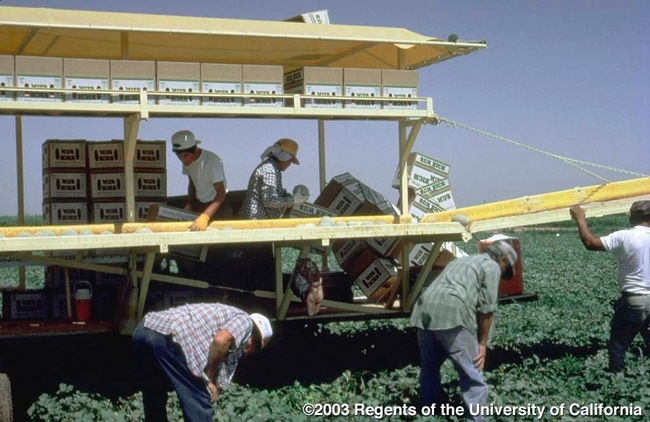 Trevor Suslow, UC Cooperative Extension food safety specialist at Davis, was told by the farm owner that they believed the postharvest system used in conjunction with the outbreak was an improvement over their previous methods — though Suslow disagrees. He acknowledges, however, that the FDA does not make a definitive statement in its growing guidelines on the safest method of cleaning, cooling or packing cantaloupe. An Associated Press article by Gosia Wozniacka profiles volunteer work by Manuel Jimenez, UC Cooperative Extension farm advisor in Tulare County. The article was published by news outlets such as the Fresno Bee, San Francisco Chronicle, ABC News, Fox News, CBS News, Seattle Post-Intelligencer and others. He and wife Olga teach life skills and farming techniques to youth on a 14-acre garden in Woodlake, Calif.
"We want to grow kids in our gardens, because we've seen what violence, drugs and alcohol can do," Jimenez told the reporter. The article also includes comments from youth volunteers in the program, past and present. "Everything Manuel did was interesting to me," said Walter Martinez, who is now a UC Cooperative Extension field assistant and also served as a volunteer at the garden through middle and high school. There are various and modern techniques these days which help to improve land fertility.